This hearty stroganoff is made with full-flavoured British rump steak, coated in crushed peppercorns and paprika, and will be ready in 25 minutes. Place the rump steak in a shallow bowl, sprinkle the peppercorns and paprika over and toss well to coat evenly, then set aside. In a large frying pan, heat half the butter and oil, add the onion and cook for 2-3 minutes until softened, then stir in the mushrooms and cook for a further 4-5 minutes. Using a slotted spoon, remove the mushroom and onion mixture and place on a plate lined with kitchen paper. Heat the remaining butter and oil in the pan until very hot then fry the beef quickly for 2-3 minutes until lightly browned. Return the onions and mushrooms to the pan and add the brandy. Cook for 1-2 minutes then stir in the soured cream and bring to the boil. Simmer for 2 minutes, then season to taste. Sprinkle with a little more paprika and 2 tablespoons chopped fresh flat-leaf parsley (optional). Serve immediately, with 500g Waitrose Fresh Egg Pasta Garlic and Herb Tagliatelle, cooked according to the pack instructions. 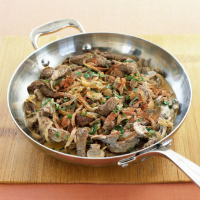 Alternatively, serve the stroganoff with basmati rice or a mixture of white and wild rice, for a more nutty texture. A soft but full-bodied, rich Spanish red would go very well here. Try Viña Fuerte Garnacha, Calatayud, made from 100% Garnacha grapes.